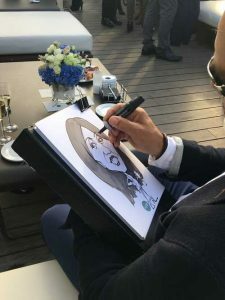 ﻿ Corporate caricature evening in spectacular Barcelona venue. 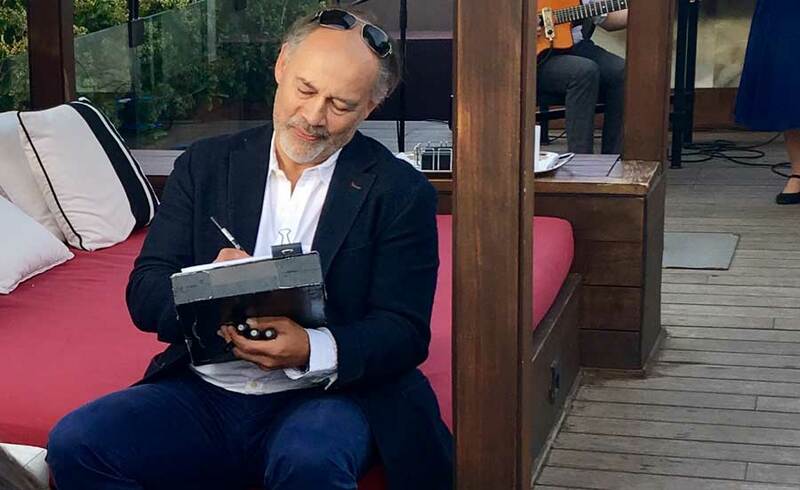 International travel specialists Expedia held a client evening on the spectacular roof terrace of Barcelona’s 1898 Hotel. Positioned on the famous Ramblas, this exclusive hotel offers roof-top dining with a 360° panoramic view of Barcelona’s rooftops and steeples. It boasts a pool with relaxation area and a rather smart bar for those that would like to sip whilst gazing over Barcelona’s rooftops. Expedia wanted something fun and different to entertain their clients. They knew me and my caricatures from other events I have done for them. 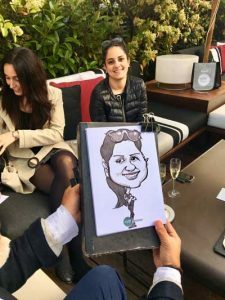 It was an ideal choice for that sort of relaxed event as it not only brought a smile to everybody’s face but each client went home with a personalised (branded) souvenir. Such gifts are kept for a long time, shared on social media and seen by visitors to the client’s office. Barcelona is a great magnet for corporate events because of its perfect weather, chilled out atmosphere, magnificent food all set in a beautiful environment. It is also modern and dynamic and promises much fun, not least Giggleface caricatures!